There are yachts. There is a breeze. There is Charlie Crist’s condo out of the corner of the eye. But on this day in St. Petersburg, March 22, there is only one figure that absolutely matters, and she’s sitting on a tree close to Cassis American Brasserie, posing for her cover shot. 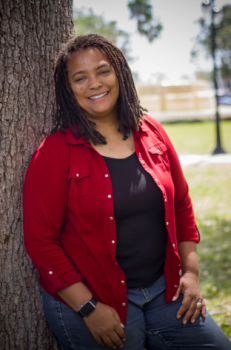 Nadine Smith is the force behind most LGBTQ measures that have changed Florida’s societal landscape. Her calm tones weighted by heavy thoughts have come to define the nature of Equality Florida, the organization she formed with Miami’s Stratton Pollitzer 20 years ago. She played rugby at the Air Force academy, she says, but she didn’t know where the score would go thereafter. So she made her own structure. 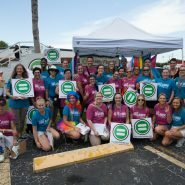 Equality Florida, which exists as both a political action committee and an activist organizing group, built inroads in Florida for 20 years, standing up to municipal commissioners and state legislators alike. The bullying fight. The adoption fight. The marriage fight. 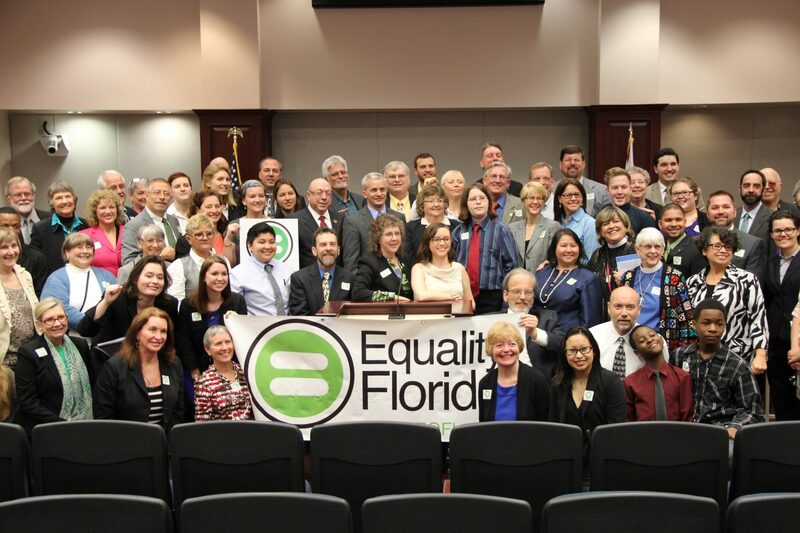 All of them have been driven by the purposefulness of EQFL and its ever-growing field of supporters. Marriage equality goes nationwide, 2015. Photo courtesy of EQFL. 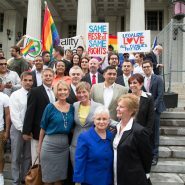 In its two decades, Equality Florida has gained more than 270,000 supporters. It has been instrumental in winning marriage equality as that house of hate cards tumbled nationwide. It has been behind the passage of more than 170 municipal bills that would not let more discrimination see the light of day, including those involving schools, employment, housing and domestic partnership. It has, in short, stood up to the bullies from the right by using reason, calculation and dignity. Lobby Days in Tallahassee, 2015. Photo courtesy of EQFL. Watermark caught up with some of the key players on the EQFL team, past and present, to look back at 20 years of running up that hill, and to see what keeps the team going. “I remember our teacher telling us the girls have to marry boys and boys have to marry girls, which I literally took to mean that a boy would be assigned to me if I didn’t pick one. And I found the gayest little boy in class, who I will call Billy. “Those experiences really helped to galvanize me around becoming an activist, though that process was sort of accidental. In college, I got involved in the Gay Student Union, which was mostly white gay men, it was mostly social club, and I literally didn’t even get the jokes they were making. I mean like socially, we were just worlds apart. I didn’t get the jokes, so I got more involved on the political side. “So those were the things that sort of led me to the local organizing that became the regional organizing that became the statewide organizing that became the national organizing for the March on Washington. And the big thing in ’93 in the March on Washington that I co-chaired was ‘everybody don’t move to the big cities, make change where you live.’ When we passed the ordinance for repeal in Tampa and in other cities, we began to, we were sort of a lab, we passed in Tampa and then Hillsborough and other cities said how do you counter this and that’s how we sort of became statewide. 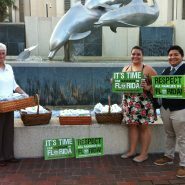 We were helping other cities do that and that’s the origin of what has become Equality Florida. 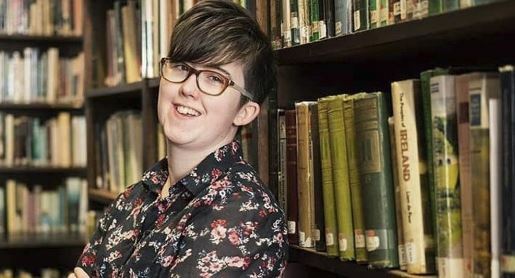 “I think the things that we have taken on have come from the bottom up and the safe-schools work we did came because teachers and students and young people were calling, and in those early days you didn’t see a lot of LGBTQ groups working a lot with young people because of all of the stigma and all of the fear. Like no, they actually do have to see us, not just allies creating a safe environment. “I remember very vividly the moment that our organization said we’re about to go all-in on marriage, and there was no polling that showed us winning. In 2008, 60 percent of our neighbors said, ‘No, you can’t have what I have. 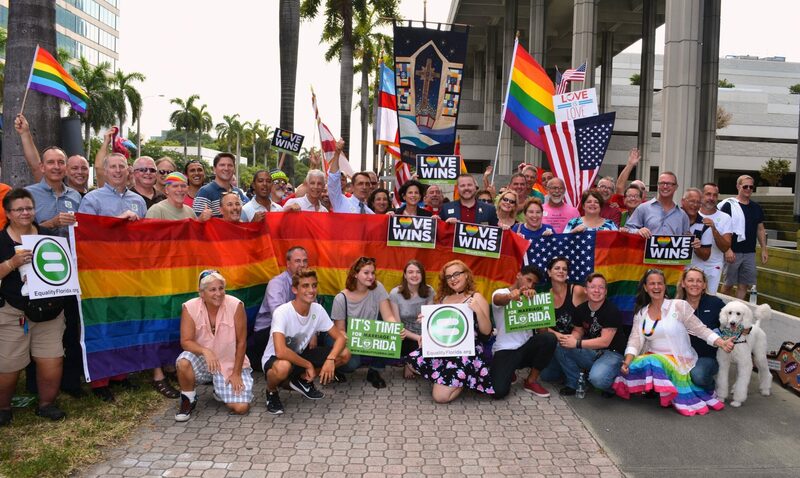 Your kids can’t have what my kids have.’ And none of the national groups that were doing marriage work prioritized Florida, and the message we got was: Florida will get it when the country gets it. So we put out a call for people willing to potentially be plaintiffs if we pursued a lawsuit and in 24 hours we got 4,000 people responding. It blew our doors off and people were sending their stories about their families and their lives and some had been tragic: my husbands dying, we’re married in Kansas, but strangers to each other here in Florida. 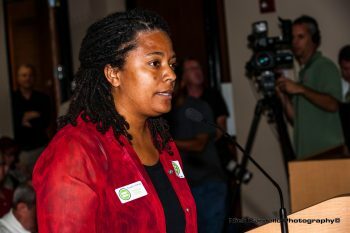 EQFL executive director Nadine Smith speaks to the Hillsborough County Commission in 2013. Photo by Nick Cardello. “We said we would pursue it in a way that allows us to do the public education to open the door for the kinds of decisions that we think about actually legally sound and culturally of the moment. And so we launched this campaign and these other victories started racking up and other lawsuits. We wanted to make sure that we vetted the folks who were going to get into it. One, to really know that they were in it because they wanted to secure marriage, not because they were craving the spotlight but also to make sure they understood that they we’re going to be under a microscope. “I think all of the plaintiffs in all of the lawsuits were remarkable, and that it was I think, when our judge lifted the ban and immediately started granting marriage in Florida [on January 6, 2015], I think our server might have crashed four or five times that day, just because of the notes and the wedding pictures and everything that people were sending us. It was incredible and I think that the other thing that’s important is that because in Florida, not because the Supreme Court ordered them to, but because judges in Florida made the beautiful case, the eloquent case for why marriage equality was so fundamental, that was part of the context in which the Supreme Court would later make it’s decision and having the south – this wasn’t just clusters of the states you would expect – it mattered a great deal. “We have an absolute, unshakeable commitment to transgender equality; it is woven into the DNA of the organization, we are, our Trans-Action program is being replicated in other states. “I moved to St. Petersburg in 1997. My at-that-time boyfriend, now husband, was finishing his college degree at Eckerd. That’s why we moved up there. This was all happening in the year that Florida passed its Super-DOMA, it’s defense of marriage act. That legislative session was a really crazy one for the LGBTQ community. 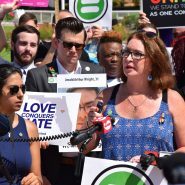 Nadine [Smith] had been involved in creating the predecessor-organization to Equality Florida, which was called the Human Rights Task Force of Florida, and that was the group that formed to try stop Hillsborough County from repealing an anti-discrimination ordinance. This precedes me: P.S. – pre-Stratton. “But my understanding is when they incorporated the Human Rights Task Force of Florida, because people in Pinellas County wanted to help the folks in Hillsborough County, they decided to make it a dual-county entity, and I think that there was something about the agreement that made it a statewide organization as opposed to just a Tampa-based organization. 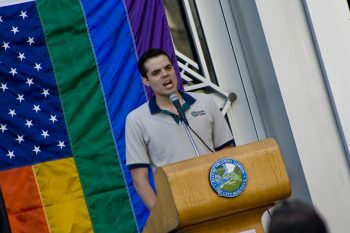 Even though their mission was really regional, they technically were the statewide LBTQ group. At the time, as legislation was moving in Tallahassee, we didn’t have anybody on the ground up there. “We got destroyed in that fight. The House voted 107-13, voted for the Defense of Marriage Act, and I met Nadine just as that fight was coming to a conclusion. 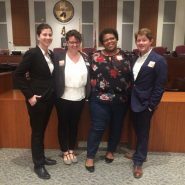 I went to a monthly meeting of the Human Rights Task Force just to find out what the local LGBTQ group was. “She wanted to know if I would be willing to sit in the office 20 hours a week. I had just moved there, casting about for work. So one of the things I was doing was helping Pride sell its Pride booth and sponsorships. So I would go in 20 hours a week. To think that was a modest endeavor was the understatement of the year. We didn’t have a computer. We had a telephone. For a desk I had these two rusty file cabinets with a door plank that could be bought for $20 across the top of them. “That would have been April of 1997 when we first started [EQFL]. What was really clear was that there was this huge need for some kind of a statewide organization. And a defeat around DOMA just really put a spotlight on it. You had this loosely knit group of advocates around it and no central strategy. Over that summer of ’97, we began having conversations with the advisory board of the Human Rights Task Force about launching a statewide organization, with Nadine and I together agreeing to go full time at ridiculously small salaries. My full-time salary was $180 a week. And Nadine’s was barely a sliver more than that. I think she was making $200. But like we said, we can’t ever have another session go buy without a full-time lobby, because not even imagining proactive legislation, just being able to block the bad stuff was important. 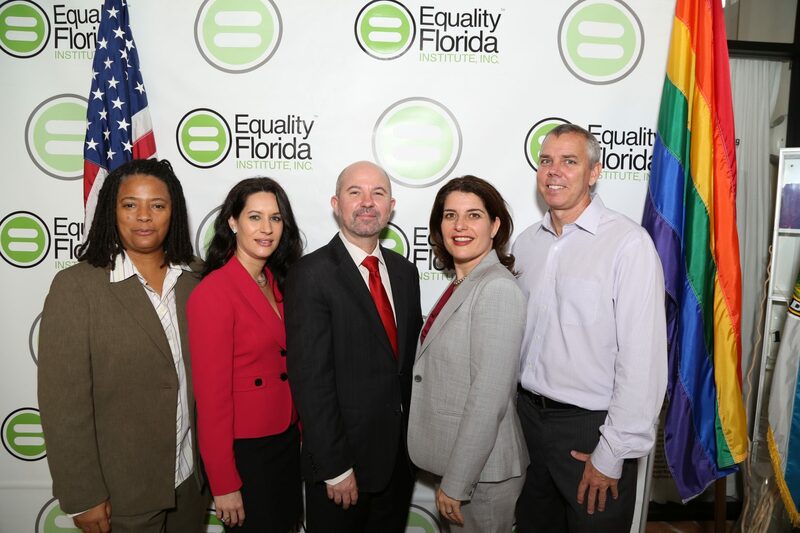 EQFL at the 2014 Marriage Equality Plaintiffs press conference in South Florida. Photo Courtesy EQFL. ressive organizations that were committed to working with us, the largest progressive coalition that had ever been assembled in Florida. “What happened was, in 2006, Florida amended its constitution to raise the threshold for new amendments to 60 percent. And all of the sudden there was a sense in Florida that we might actually be able to beat this. At the time, there was just a belief that state organizations were not themselves sophisticated and strong enough to lead the multimillion dollar campaigns. “I think the strategy at that point was to raise enough media funds so that we can run television ads. I think anybody who goes back today and watches those ads, and I have, will recognize what a messaging mistake they were. They were from a time when we believed that the only way that we could win was to hide gay people. 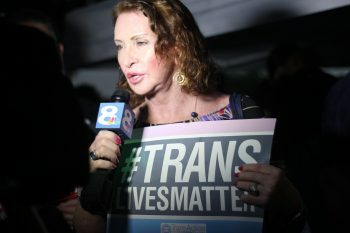 “We really didn’t have a focus on [transgender issues], and it was in meeting with Nadine that the charge was made that my job was to be to make sure that transgender inclusion was woven into everything we did at Equality Florida. And looking back at that, it was very insightful because it was right before this rapidly emerging wave of the transgender movement. 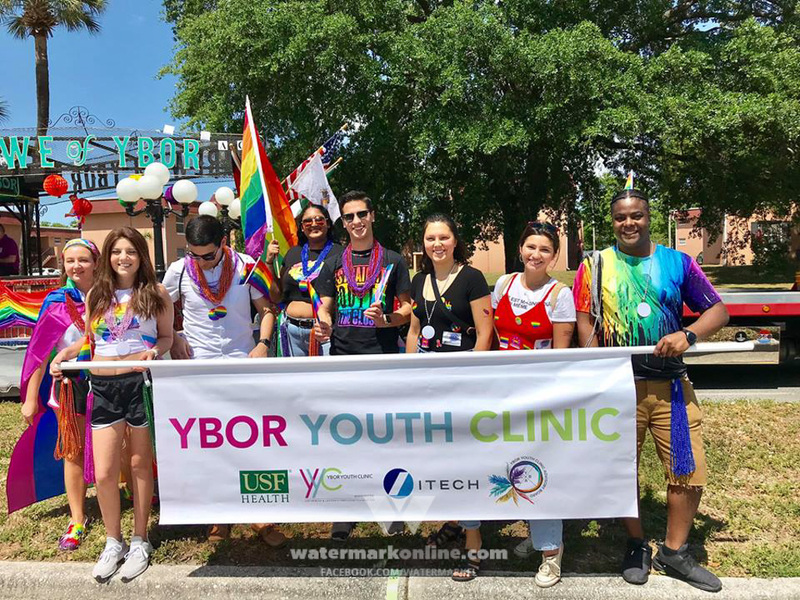 It kind of took off, so our timing was really good in reference to that and it was a very positive experience because Equality Florida threw all their resources into giving me all the things I needed to do my job. “It’s interesting because my corporate training influence experience and Wells Fargo certainly did train senior management in everything. It all just comes into different attributes of leadership and training. I was able to bring that corporate dialogue and tenor perhaps so that when I’m speaking to other corporations. Coming from that background, we kind of spoke the same language so I think that’s what made it so successful and continues to be successful in reaching out to these major employers. Gina Duncan at a #TransLivesMatter candlelight vigil for India Clarke. Photo courtesy of EQFL. “That really was Nadine’s attraction, as well. She thought that she needed someone coming from that environment to be able to speak to that environment. It’s proven to be right and the structure, kind of the background that I’m bringing is not only in the training facility but developing a structure across the state. As regional manager for Wells Fargo, I have area and branch managers in all the major metropolitan areas in the state so first thing I saw was we needed bandwidth, we needed scope so we developed Trans Action which is having branch managers in all the major metropolitan areas who are volunteer, transgender and gender nonconforming advocates in major markets that we can call on. 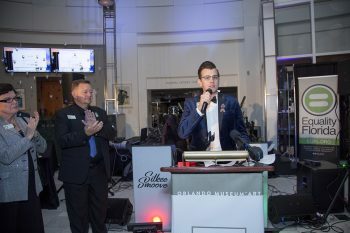 Michael Farmer speaking at EQFL’s Orlando Gala. Photo courtesy of EQFL. “I’ve been a little bit of everything. I got started as an intern in 2007 and I got hired on full-time in 2009 to work on our safe-schools program and worked with 10-15 school districts in Florida to strengthen gay-straight alliances in schools and enact anti-bullying policies. I was a little green then; I’m sure as a 19- or 20-year-old I was a little angry about it and definitely emboldened. 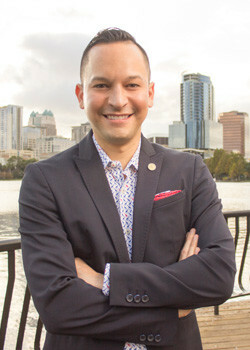 “Part of my paradigm shift that happened when I starting working with Equality Florida, when we fought for the domestic partnership registry in Orange County, as somebody who grow up here and was born and raised in Apopka, I never thought that there would be any kind of recognition for gay couples in the state that I was in. That really reshaped how I knew my work could make things possible. 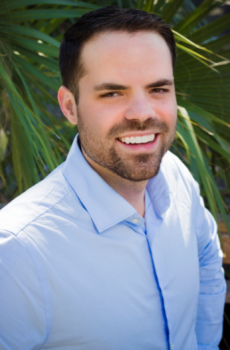 “Ultimately, Equality Florida, when I joined the team there were six of us. With each big fight we’ve taken on, we’ve just gotten bigger and stronger. It really started around the marriage amendment in 2008, but the marriage lawsuit in 2014, and into 2015, it was really incredible to all of our programming. It made us more visible. I think LGBT organizations struggle to build branding, but to be a force, that was an immense boost for us who were doing the work. “I got involved on the advice of Joe Saunders. I had just moved back from my stint in Georgia. It was maybe a year or a year-and-a-half after Barack Obama was inaugurated. I was at a point in my life where I really wanted to get more politically engaged. I wanted to start advocating for the thing that I cared about the most. I talked to Joe, because he was somebody that I felt like really cared about the community and the LGBTQ population. How do I get involved? I’m a manager at the Men’s Wearhouse. “They offered me an internship in 2010. I was an intern for Michael Farmer at first. We were doing a lot of back work. I was working for a lot of equality candidates in the 2010 election and knocking on doors. 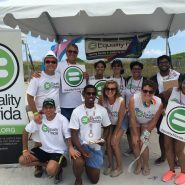 But also, I was working Pride for Equality Florida, tabling for those kinds of events. 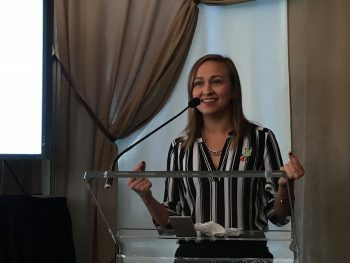 “What really pushed me over the edge was when I was acting as an advocate, when I was at Equality Florida, fighting the transgender bathroom bill in 2015. I was so frustrated that these hostile, terrible anti-LGBT bills had been filed. 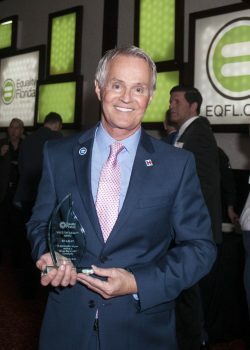 I felt that I could be most effective in advocating for the issues that I really care about, not as a lobbyist for Equality Florida, but instead as a member of the Florida Legislature. And that was what pushed me to decide to run for office. 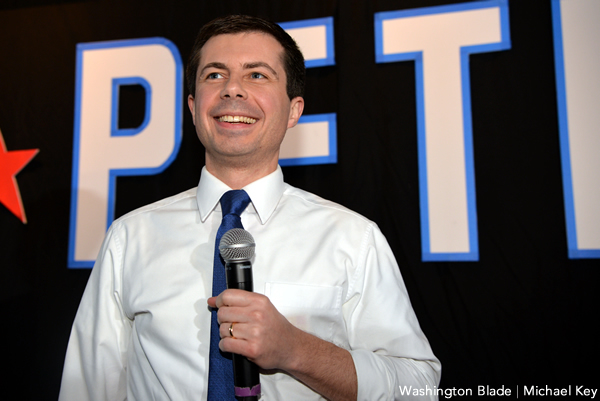 “When I decided to run for public office, I thought I knew what my goals and priorities would be in terms of public service, but all of that changed on June 12. The tragedy was a painful and horrific reminder that homophobia still exists, and must be disarmed. “I’ve been involved from the very beginning, 1997. I was even involved with the Human Rights Task force before that. I think early on, I was just glad to see that there was an organization out there looking out for me and my community. I think Stratton and Nadine have grown tremendously in 20 years. I’ve been really heavily involved since 2003. Nadine is probably the best in the country at what she does. “I was actively going before the City Council and county commission… when they reversed the ban on a human rights ordinance. I even put meetings together with some of the county organizations. I brought one of them in to see the members of the community, then I brought in families. I don’t think he realized the damage of not being supportive. “I think when we finally figured out that telling our stories to anyone who would listen, that’s when the majority of Floridians would listen to our story. Now we’re suffering the backlash. “And I don’t think Nadine spoke at that one; she was our keynote at the second one that we did my senior year in Tallahassee. I came across them in 2003-2004. I began to work with them in 2004-2005. Nadine was our keynote speaker and it was the Florida Collegiate Pride Conference; FCPC is what we called it. “And then also that year while we were organizing the conferences, Mallory Wells and I decided to team up and launch a statewide program led by students against the adoption ban called Kids Come First, which Watermark covered, actually. We were very excited about it. It was the biggest deal. Commissioner Patty Sheehan came and spoke at UCF. There were, I think, 2,100 kids in foster care that we were saying come out and get adopted by LGBT parents against the adoption ban. So, we went out and raised like $6,000 or $7,000, which was a huge deal to us, and bought a bunch of stuff that represented the children. We had 2,100 items. We toured around college campuses and universities collecting postcards to send to Tallahassee. 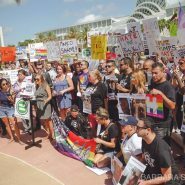 So we did that in partnership with Equality Florida. Nadine spoke at some of that stuff . She knew she wanted to have a relationship and open up an Orlando office. Amendment 2 rally in Orlando. Photo by Jake Stevens. “I got hired in the summer of 2005; I was finishing my undergraduate political science degree at UCF. Mallory had already been hired. She came at it through HRC. Mallory was, I think, on staff at the time, but hadn’t opened an office. And in 2005, that summer, we opened up our very first Orlando office. I cannot, for the life of me, remember where it was. There was one point where we were in the Watermark building. We had an office before that and that must’ve been the first one. The Watermark office was the second one. “It’s only my third year, so I’m much newer than any veterans there. My background was actually in international human rights and human traficking. I really had no inteniton of working for a domestic nonprofit, let alone a nonprofit in Orlando. 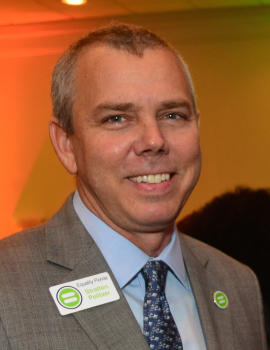 “When I started, the state of Florida was about to come under a seismic shift. Joining EQFL in May 2014, it was like being at the very top of a rollercoaster. To be at the center of it, to watch how we built a movement on real stories from real people, on dignity, and fairness. This really raw emotional plea that we wanted the same things as everyone. “I feel incredibly lucky to be representing LGBT issues. I feel that more and more it’s a human issue. I feel really humbled. It’s a huge privilege and a huge responsibility. “We are investing deeply in shaking up Florida from the inside out. The reality is that Equality Florida’s work, it doesn’t always feel tangible. We don’t have a direct service modell. We are and our work is all about changing culture and changing policy. Pam Bondi marriage petition, 2014. Miami marriage hearing, July 2014. Gina Duncan and Michael Farmer at the Rally to End Hate, 2016. 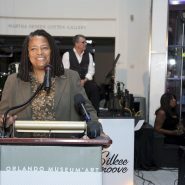 Nadine Smith at the Orlando Gala, 2016. Crowd at the Rally to End Hate, 2016. 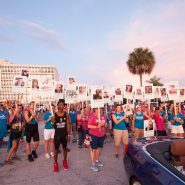 EQFL’s Pulse Tribute at St. Pete Pride, 2016.